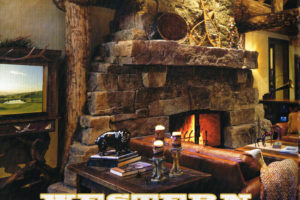 "As rugged as the Bighorn Mountains and as comfy as a well-worn saddle, this Wyoming home is a little bit Western, a little bit Eastern. Rustic—but with a certain spit and polish, too. Built on a multi-acre property in Sheridan dubbed Big Goose Ranch, the...home was designed to feel as much a part of the landscape as the adjacent cottonwoods and hawthorns. 'It’s a phenomenal property with an existing historical barn that has great skeletal bones,' says architect Kipp Halvorsen. His Bozeman, Montana, based firm, Faure Halvorsen Architects, specializes in creating rustic, cabin-inspired houses that blend seamlessly into their natural settings. 'My thought in designing this house was to embrace that history, embellish it, and make the house feel like it’s been there forever. I wanted to tuck it into the surrounding scene, so it felt appropriate. 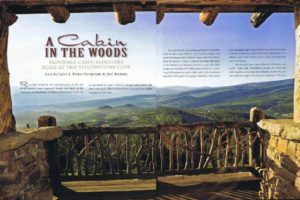 '” Published in Mountain Living in their September/ October 2016 issue. 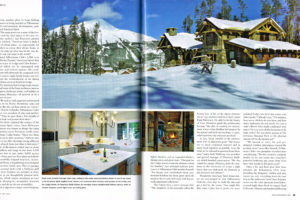 "Old West and New West meet in Big Sky, Montana, where a love of rustic style combines with a passion for great skiing." 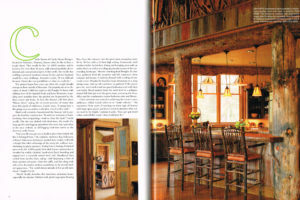 Published in Big Sky Journal Home in their Annual Issue 2013. "In Montana's Yellowstone Club, a getaway home showcases the old west vernacular- with an industrial edge...'Capturing the views is the main purpose of the house. The architecture and materials become secondary to framing them,' Halvorsen says." Published in Mountain Living 2012. 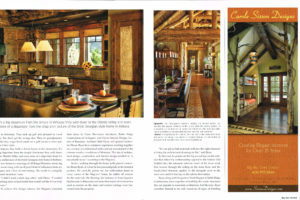 "Combining all the elements of a true Montana home, the team of Faure Halvorsen Architects, Battle Ridge Construction and Haven Interior Design created the perfect retreat." Published in the Summer 2011 issue. "The birth of the usual western town was spurred by discovery—of gold, land, or trade. But one “old” town, tucked into the grandeur of Montana’s Crazy Mountains, was spurred into existence by the creativity of a Montana architectural firm. Faure Halvorsen Architects... created a version of an old western town on a cattle ranch east of Livingston...“It started as a very simple thought,” says Kipp Halvorsen, “We wanted to design a residence based on the concept of an old western town.” The project’s owners were quickly on board with the idea and soon dubbed the new town, “Deadrock,” giving life to the fictitious town from Thomas McGuane’s book Nobody’s Angel." 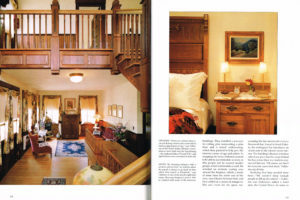 Published in Distinctly Montana's Spring 2011 issue. 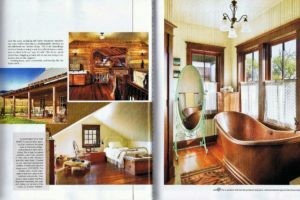 "Like the main house, the guest cabin is a testament to Montana heritage and style. Creating a complete living space... within a tiny footprint was an enormous challenge, but one that Faure managed with considerable aplomb. 'Scale forces intimacy,' explained Faure... The Allens wanted to create something texturally rich and grounded by place, said Faure. '(In the guest cabin0 people can explore 100 years of history by touching the wood,' he said." Published in Big Sky Journal HOME Annual issue 2007-2008. "Perched on a hill in Eagle Rock Reserve, southeast of Bozeman, is an 8,000-square-foot home that is exactly what the owners intended it to be - a house that looks like it has always been there, rather than a trophy house sitting obtrusively on a hilltop." Published in Distinctly Montana in the fall 2006 issue. "A Montana couple uses standing dead wood and recycled materials to build an eco-friendly getaway... 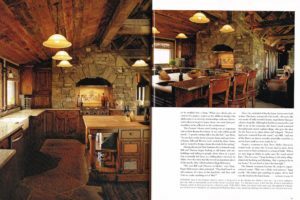 This labor of love became a driving force in the log home's design. 'We didn't want all that wood to go to waste, so we brainstormed about how to give at least some of it a new lease on life,' Carole says. Working with Kipp Halvorsen... the couple designed a floor-plan that would incorporate the large fir and larch logs... as standing columns inside their home." 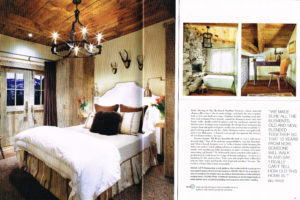 Published in Log Home's April 2005 issue. 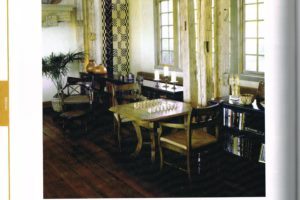 "'Our overall concept was to build a place that looked old, like it belonged here,' she explains. Architect Kipp Halvorsen of Faure Halvorsen Architects heeded their wishes well with a design that takes advantage of the steep site without overwhelming its piney presence." Published in Mountain Living in April 2004. "'When our clients give us control of a project, it gives us the ability to design. 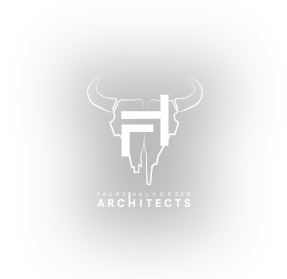 Our philosophy is to develop relationships with our clients, and endeavor to get to know them- we want their personalities to be reflected in the architecture," says Matt Faure." 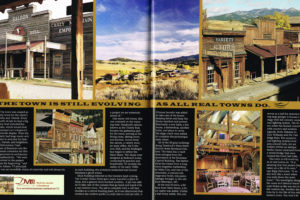 Published in Mountain Living in December 2004. "'God made the country,' wrote the English poet William Cowper, 'and man made the town.' Seldom has this been more true than in the curious case of Deadrock, Montana, a town made - and made up - where formerly there was nary a hitching post... Deadrock was originally conceived as a place for the couple to host family reunions... The following February Patch decided to add a two-story hotel... The next year a pool hall was added on to the saloon and a livery stable was built at the foot of Main Street. This year, as Deadrock evolves from guest quarters into a full-fledged guest ranch, Fullerton is working on eight more buildings, among them a general store... a post office, a jail, a laundry and two lodges." 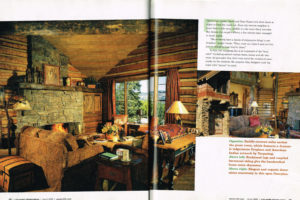 Posted in Architectural Digest's June 1996 issue. Want to send us a quick message? Click the button below and fill out our simple form and we will get back to you as soon as possible.